More than two years ago we started ROMPRO, with the aim to connect the Romanian community in the Netherlands, to inform each other and to integrate more easily in the Dutch society. At the same time we want to introduce Dutch people to the rich Romanian culture and be true ambassadors of Romania. We have achieved a lot: 12 events organized and 12 co-hosted with more than 1500 participants, 10 support cases for people in hospitals, 5 partnerships with other organizations, 2100 likes on Facebook, 3000 people that follow us on multiple channels, an online language school for Romanian and Dutch lessons with more than 300 participants, a Romanian school in Amsterdam with more than 100 children who attend courses, a Romanian Business Community with 35 members and recently even a theatre group! Thanks you all for your support and help to accomplish this! There is a need for these activities. So we will continue! We have a lot of plans. A big dream is to set up a Romanian centre in the Amsterdam area. A meeting place where we can and propagate our Romanian culture and where we can organize even more events and projects. In order to continue all activities and to realize these plans, we want to professionalize ROMPRO and will start fundraising in the Netherlands and in Romania to finance our projects. network of people in the Netherlands by becoming a ROMPRO friend! Why should you support us? Because through our events we create an active Romanian community in the Netherlands, we provide information support and help to integrate Romanians into the Dutch society. We also preserve our Romanian identity and promote cultural events for Romanians. If you belong in such a community of Romanians (and not only), right here in the Netherlands, help us to continue the activity of ROMPRO, supporting us financially with a small donation. The Foundation works only with the help of our passionate volunteers who devote many hours of their free time to this cause. But we also need financial help. 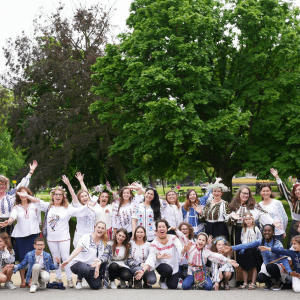 • 5% discount on Dutch, Romanian and English online courses (Interconnections Online School) and for children and adults workshops from Romanian School Amsterdam. • discounts on events organized by ROMPRO projects: Romanian Business Community (RBC), Romaian School Amsterdam, Interconnections Online School. Note 1: You benefit from all this no matter how much you want to donate. Note 2: Friends who registered in 2018 (before December 22) will benefit from the discounts received at the beginning and throughout the year 2019. How does it work? It’s very simple! Discounts and offers for courses and events can be used if you mention your name. Also, if you chose the ‘Family friends ROMPRO’ package, you mentioned the name of the family members in the registration form and we can apply the discounts to them as well. Follow our website www.rompro.nl, the Facebook @rompronl page and join the Friends of ROMPRO (FB) and Romanian Professionals Living in The Netherlands on LinkedIN. Family Names - adult (1) - Fill this only when you chose to be a Family Friend. Family Names - adult (2) - Fill this only when you chose to be a Family Friend. Family Names - child (1) - Fill this only when you chose to be a Family Friend. Family Names - child (2) - Fill this only when you chose to be a Family Friend. Family Names - child (3) - Fill this only when you chose to be a Family Friend. If you have any questions, remarks or project ideas please let us know via contact@rompro.nl.